What Is a White Pumpkin? And What Can You Do with One? What is a White Pumpkin? Mystified by white pumpkins? Here is the scoop on these attractive albinos. Definition: Orange is so yesterday. Here in New England, white pumpkins, once a novelty, are becoming increasingly common, and these intriguing white orbs are all the rage when it comes to chic autumn decorating. But what is a white pumpkin? These albinos with natural white or ivory skin (also known as the shell) have been bred by pumpkin growers, and seeds for specific varieties, such as Lumina, Cotton Candy, Full Moon, Polar Bear or miniature Baby Boo, can be purchased and planted. Direct Gardening, for example, has Lumina PVP and Capser white pumpkin seeds available for online ordering. White pumpkins must be planted after the risk of frost has passed, and they take about 90 days to grow. Once white pumpkins mature on the vine, they should be picked promptly, or there is a risk of discoloration. Can you grow giant white pumpkins? You had to figure the giant pumpkin and white pumpkin crazes would converge. The short answer is: Yes! There are several varieties of giant white pumpkin seeds on the market, but these pale pumpkins aren't setting the sort of records their ton-plus orange cousins have achieved. So, what can you do with a white pumpkin? They're great for carving (see an example) because their skin is not quite as thick as an orange pumpkin's. Can you guess what color they are on the inside? Hint: It's not white. They are even better for painting. White pumpkins provide great contrast in fall gourd and pumpkin displays. They're elegant unadorned as a table centerpiece, as you'll see in this Martha Stewart Living photo from 2003: She's always ahead of the curve! Monogrammed white pumpkins are even being used as fall wedding decorations. A white pumpkin tied with a red velvet ribbon and positioned atop evergreen boughs would make a lovely holiday season decoration. 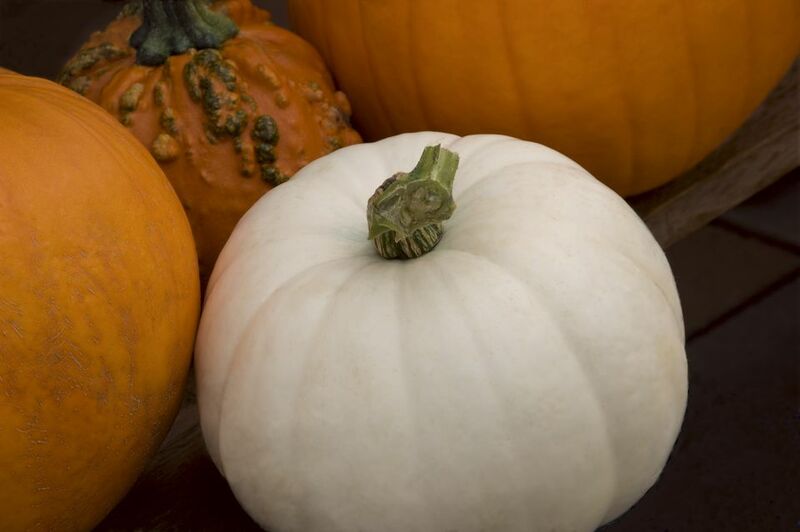 Like many gourds, white pumpkins stored properly can last through the winter months. Can you cook and eat a white pumpkin? Sure! The flesh inside a white pumpkin is edible. White pumpkin can be substituted for orange pumpkin in many recipes, whether you're baking pumpkin pie or concocting a pumpkin soup. The satiny texture and sweet pumpkin taste of the Lumina variety is excellent for baking. Try using a hollowed out white pumpkin as an attractive serving tureen. What about eating white pumpkin seeds? Yes, but first you'll want to toast them in the oven, toss them in a skillet or candy-coat them. Can you freeze white pumpkin? Just like typical orange pumpkin, you can indeed bake, scoop, puree and then freeze white pumpkin by following these instructions. Where can you find white pumpkins in New England? The Pumpkin Patch at the South Congregational Church in Granby, Connecticut, is one reliable source if you want to carve a white pumpkin jack-o'-lantern. Is a Lawyer Necessary for Divorce in Arizona?